Thank You for playing in our events. Please pass this information to your parents. Couple of Reminders and Suggestions: We recommend you ask your players and parents to arrive 10-20 minutes after Blind Draw, That way you can direct them to correct field. Brackets are posted for this weekends "Turbo". See below draw times for your age group and divisions. 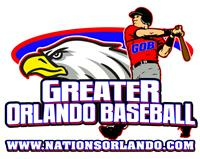 Brackets will be filled in on website right after "Blind Draw"
No Drop dead- no new inning after 55 minutes. Send your pictures to photonations@yahoo.com for a chance for your team or player to be featured on our website. "Turbo Baseball Tournaments" are designed to create an accelerated event that will include all the competition and excitement of a normal weekend tournament, but to fulfill all these needs at a pace that will be accomplished in one 9:00am to 6:00pm day. Yes one day 9:00am -6:00pm. All games have a 5 inning or 55 minute time limit. No Drop dead- no new inning after 55 minutes. "Turbos" Allow us all to play on Special Weekends without conflicts, such as Super Bowl Sunday, Easter Sunday, Mothers Day, Fathers Day, etc..
www.nationsorlando.com Call Today & Sign Up!